Today I'm asking a question that probably has never, ever, been asked before on the history of the internet. Could Dorothy really have walked all the way down the yellow brick road (which I presume was around 10 miles) in those sparkly ruby heels? Because I beg to differ. Lets think about it now girls. We all know after purchasing our scrumptious new pair of heels that the payment doesn't stop there oh no we also also pay in many other ways, ways that aren't as pain free as punching our pin into a card reader. Because lets face it, if we want to wear our heels from the beginning of the day to the very end no matter how 'comfortable' we first naively label the pair, after walking about 2ft in the store with them on at first inspection, we soon come to realise they aren't in fact so 'comfortable' after all in fact try excruciatingly painful. Which brings me back to the question and therefore I say No of course she couldn't have.This is why I bring forth this seasons trend of the flat. From chunky patent brogues to the chicest of loafers this trend is huge for S/S 14 although we're not quite ready for the pretty sandals yet, below are a few to make you want to wish away these winter months whilst above are some to allow you to endure the winter in style. Also above are the blogger babes, (from left) Leandra, Danielle, Alyssa, and Shope leading us into the 180 ° revolution & what a chic fashion they're all doing it. 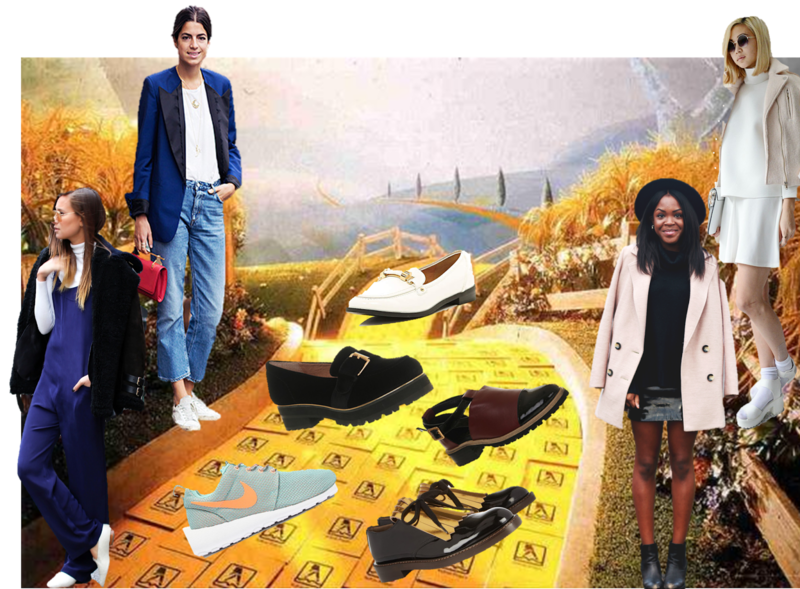 So Eventhough Dorothy's already suffered her fate as in her day killer flats had not been mastered by the likes of Dries Van Noten and Givenchy we all have no excuse as beautiful flat's are all the range now darling. Hurrah! You strike an interesting question. She might have been able to if she took a break ever half mile or so? I'm not really sure. But I like comfort on my feet so I'm usually found in a pair of oxfords or trainers. If we're being technical she probably couldn't have been swept up in a tornado and dropped of safely in munchkin land either but in any case.. I'm really loving chunky sandals too right now. These picks are really great! I recently came a cross a white and black pair that I'm in love with!! thank goodness for the new trends - flats, oxfrods, chunks, kitten heels, and sneakers... our lives as fashionistas are definitely easier with these. totally agree with you darling, there's no such thing as comfortable heels - it's all a big lie. we all know the price we pay, money and effort wise, for looking great in them. Love this! I'm glad there there are so many interesting and beautiful flats this season. And you're right, Dorothy's feet must have been ready to fall off after such a long trek in those heels! esos zapatos son geniales! me encantan! i wasn't a big fun of chunky flats but i see that there are everywere and they can be feminine too! if u have time stop by my blog or follow me on bloglovin, anything would be nice! What a super cute idea! I love the shoes you've picked! They look lovely and comfy! i'm so loving the mint ones! Omg, haha! This is so creatively written! I've been so glad for the overhaul of comfy shoes over stilettos and stuff. My big and clunky feet won't allow my itself to look so graceful in the shoes presented above, but I appreciate them nonetheless. Also, Dorothy is a boss.